posted on Feb. 06, 2019, at 9:00 a.m. 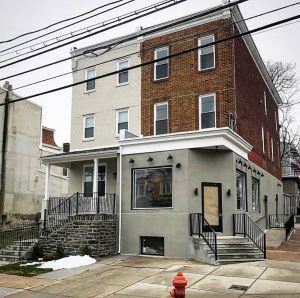 When NKBA first checked in on Trades for a Difference in 2017, the non-profit started by 2016 Thirty Under 30 honoree Jordan Ferrarini was nearing completion of its first project, blight removal in a challenged Philadelphia neighborhood. Now, a little over a year later, the Chew Avenue Project — once a dilapidated nuisance bar — has been converted into a community center, where TFAD trains at-risk youth and hosts educational and cultural events for the neighborhood, and TFAD is moving on to its next project. Before and after at the Chew Avenue project in Philadelphia , a building restored by Trades For A Difference and converted from a nuisance bar into a community center. The revitalized Chew Avenue building is now a TFAD learning center with classrooms, and it serves as a community center for other learning programs, like financial literacy, computer coding, web design, skills workshops for seniors or book readings. Ferrarini said TFAD invites other organizations to present their programs in the space as well. Ferrarini, 32, comes from a family immersed in the business, including his mother, Donna Ferrarini, an interior designer, and brother, Matthew Ferrarini, principal designer at Ferrarini Kitchens in Elkins Park, Pa., a suburb just north of Philadelphia. This business specializes in design and remodeling of higher-end kitchens, baths and interiors. Jordan holds multiple trade licenses and certifications including a Construction Management Certification from Temple University, an ICC Master Electrical License, and a National Association of Home Builders Carpentry Certification. He is also an authorized OSHA instructor/trainer.He founded Trades for a Difference, a 501c3 non-profit organization, in February 2016 as a way to give back to underprivileged neighborhoods throughout the city. He owns a thriving electrical contracting business, and consults with Ferrarini Kitchens, which Matthew now heads. Personally, Jordan received a Changing Landscapes Award from Temple University, Community Champion recognitions from Mt. Airy USA and State Senator Art Haywood, and was inducted into the Class of 2018 Leadership Philadelphia Keepers Program, which honors young connectors, doers and visionaries making a difference in the city. TFAD has four permanent staffers now, some of whom came out of the program. “We have had a 100% completion rate for our past seven cohorts — our six-week apprenticeship preparation classes,” Ferrarini explains. “Many of them attained full-time employment and have gone on to union jobs, as well as studying to be architects, engineers, construction managers and designers. Each cohort is exposed two opportunities in the trades. We are now teaching drafting and blueprint reading 101, hands-on learning in electric, carpentry and masonry, we are teaching auto-cad design and 2020 training at our community center. 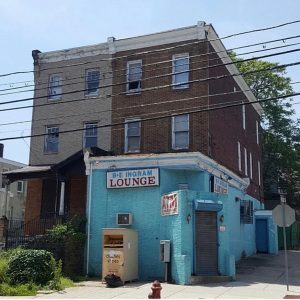 TFAD’s next blight removal project is a home dating to the late 1700s that was once owned by a prestigious Philadelphia family named the Royals. It is a designated historic property, in the city’s Germantown neighborhood. A full restoration is planned for the building, which is now 3,800 square feet but will expand to about 9,500 square feet when it’s completed. The organization hopes to turn it into another Trades for a Difference workshop and training center, but it will also include a transitional housing component. “I’m working with my sister, Javona Williams, on her project: the Abraham Project, which mentors homeless single fathers, helping them learn skills to get back on their feet,” says Ferrarini. “We hope to take the Royal building and create eight two-bedroom apartments. We will house some of our young people in these units. We’re looking to promote civic and social responsibility among the young people and the fathers. The program has changed a bit since its founding, most notably in adding more intellectual and design-oriented pathways, and adjusting the target demographic to focus on young people 16 to 26 years old. Previously, the age parameter was 16 to 30. What’s the most important thing the young people taught him?